REVIEW: ALTERED CARBON IS SUPERB! Devangshu Datta enjoyed the Netflix series thoroughly! 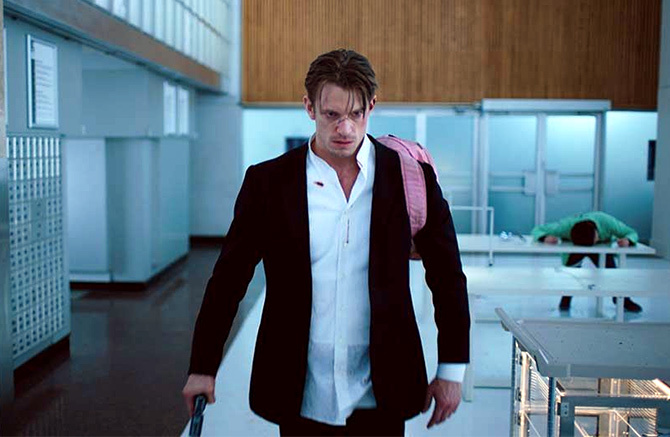 IMAGE: Joel Kinnaman in Altered Carbon. 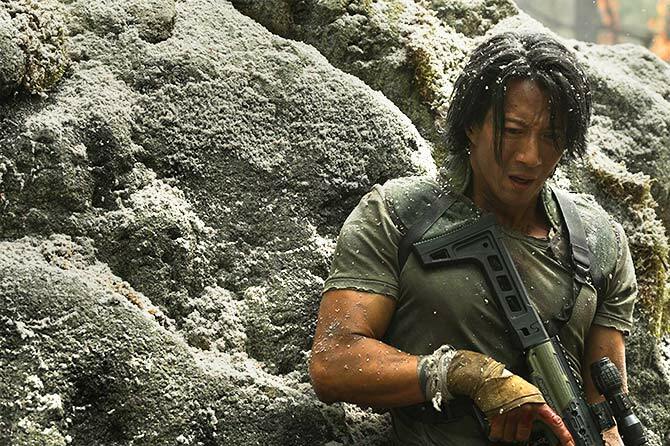 The Netflix series Altered Carbon features a hero, Takeshi Kovacs, who is both 40 years old and 290 years old. 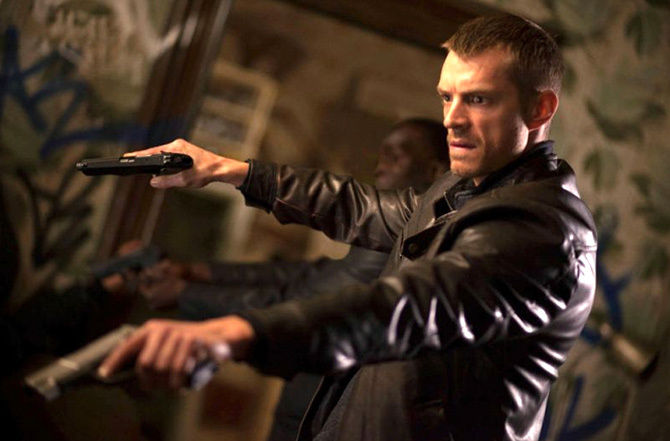 He is played by Joel Kinnaman and Will Yun Lee. Kovacs is a former soldier serving a penal sentence. He is released from prison and hired as a detective with a rather odd brief: A billionaire wants to know who murdered him (the billionaire) in a manner that seems like a 24th-century riff on the classic locked-room murder mystery. Fans of the cult cyberpunk series starring Takeshi Kovacs would not be. Richard Morgan created a richly complex universe in a string of novels with Kovacs as the first-person, anti-hero protagonist. Morgan plays around with multiple plotlines across a backdrop that involves improvised variations on immortality, large-scale violence, complex scientific concepts, virtual environments indistinguishable from reality, small-scale violence, musings on consciousness, bits and pieces of poetry, random doses of philosophy, complicated sexual deviancies and, need I mention, more dollops of violence? 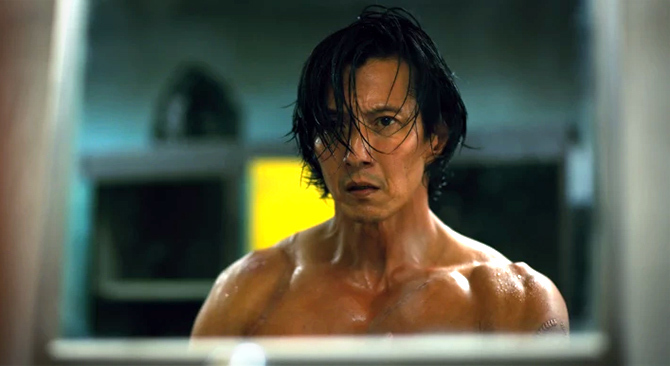 IMAGE: Will Yun Lee in Altered Carbon. Kovacs, like everyone else in that fictional universe is close to immortal. Everybody wears an implanted chip (called a stack) embedded in their spines at the base of the brain. That chip contains their consciousness, their essential 'me', and it records all their memories and sensory inputs in real-time. If the body dies, whether through old age, illness, violence or accident, the stack can be retrieved and uploaded to a new body. The consciousness lives on, in a new body, complete with memories. Real death happens only if the stack is destroyed. Criminals are punished by being put into storage with their stacks decommissioned and not given bodies. Bodies are therefore, referred to as 'sleeves' in the 24th-century patios. The rich keep clones of their own bodies in storage and continuously save the data from their stacks to an alternate location. Bodies can be cultured with special neural enhancements. Uploading of consciousness in this fashion is something that the Ray Kurzweil brand of futurists are already talking about. In the Morganverse, if somebody wants to travel from A to B, the simplest way to do so is to upload data from the stack into a 'sleeve' at B. It is also possible to upload stacks into virtual environments that are indistinguishable from reality, while being vastly speeded up. All this means that humans can do delightfully risky things and indulge in an entire range of perversions that are impossible in our current state of the art. This is an interstellar civilisation. Data from stacks can be transferred through wormholes ('needled') almost instantaneously to distant planets, which have been colonised. That way, human beings can travel anywhere more or less instantly. Different planets have been colonised by different nations at various times. Kovacs comes from a planet that was colonised by East European labour hired by a Japanese company. Hence, the peculiar conjunction of Japanese forename and East European surname and a tendency to occasionally lapse into quoting haiku (in the novels). Special forces soldiers like Kovacs receive training embedded directly into their stacks. So, they can take over a new body and instantly put their own combat skills into operation. Actually he is not a special forces soldier -- he is an Envoy of the UN Protectorate. As the human race spread across Morgan's universe, people carried their age-old feuds into space and developed some new ones. So the UN recruited and trained Envoys. Envoys are soldiers, diplomats, spies, hypnotists capable of subtly influencing people, trained to perfect recall, conversant with multiple languages and cultures. Kovacs went rogue after serving for years as an Envoy. I can't tell you much more without trespassing heavily into spoiler territory. But the books work for fans of both Raymond Chandler and William Gibson. The TV series is superbly shot and the acting is adequate. It adheres, with certain very important differences, more or less to the plot of Morgan's first novel. The special effects are lovely. The sets are plain fantastic. Some of those 'important differences' just seemed like hokey though and, as in other adaptations of novels into screenplays, you wonder why they bothered. I enjoyed the series thoroughly and was provoked into reading the books all over again.